Egyptian Coptic Pope Tawadros II (L), Pope of the Coptic Orthodox Church of Alexandria, and Patriarch of Saint Marc Episcopate receives Egyptian President Abdel Fattah al-Sisi (R), at the new Coptic Cathedral at the new Coptic Cathedral "The Nativity of Christ" in the new administrative capital, 45km east of Cairo, Egypt January 6, 2018, in this handout picture courtesy of the Egyptian Presidency. Egypt’s President Abdel-Fattah El-Sisi will inaugurate the country’s largest cathedral on Sunday, which marks Coptic Christmas Eve, Coptic Orthodox Church spokesman Father Boules Halim told Ahram Online. The Nativity of Christ Cathedral in Egypt's new administrative capital occupies 30 percent of the 4.14-acre site allocated to the complex. The cathedral can accommodate 8,200 worshippers and the complex has been designed around a large central square. It includes a papal residence, a reception hall, meeting rooms and offices. Halim said that the preparations for the inauguration ceremony had been organised by the Egyptian presidency. Pope Tawadros I will be in attendance, and diplomatic delegations from different countries will also attend, he said. It will be followed by a mass held by the pope, he said. El-Sisi commissioned the building of the cathedral in January 2017. “It is expected that the president will also inaugurate the new administrative capital’s El-Fattah El-Alim Mosque on Sunday,” said Halim. Pope Tawadros is expected to give a speech at the mosque after its inauguration, Anba Morqos, the bishop of Shubra El-Kheima, told CBC Extra News on Saturday evening. The newly constructed mosque can hold more than 17,000 worshippers and is expected to be one of the largest mosques in the Middle East. The mosque is located on the Middle Ring Road in the New Administrative Capital. The Nativity of Christ Cathedral was partially opened in 2018 with Pope Tawadros II and El-Sisi entering hand-in-hand, and the pope conducted Christmas Eve mass for the first time in the cathedral. The attendees applauded, and Copts, who make up about 10 percent of the population, heralded El-Sisi’s appearance there as a milestone. 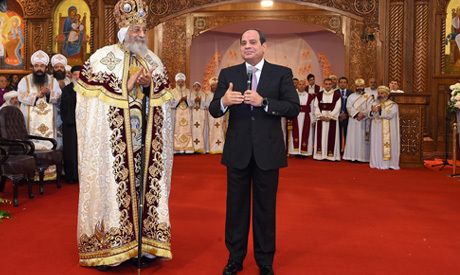 It has been El-Sisi’s habit to visit Coptic churches during Christmas Eve since he took office in 2014. Coptic Christmas, which falls on 7 January, is a paid holiday for employees of the country’s private and public sectors. In recent years, Copts have been victims of several deadly attacks against churches by Islamist terrorists during major holidays. In response, the country has tightened security near churches, particularly during Christmas celebrations. The new administrative capital, set to be completed in 2020, is part of the government’s plan to expand urban areas to deal with the country's rapid population growth and improve the nation's infrastructure.